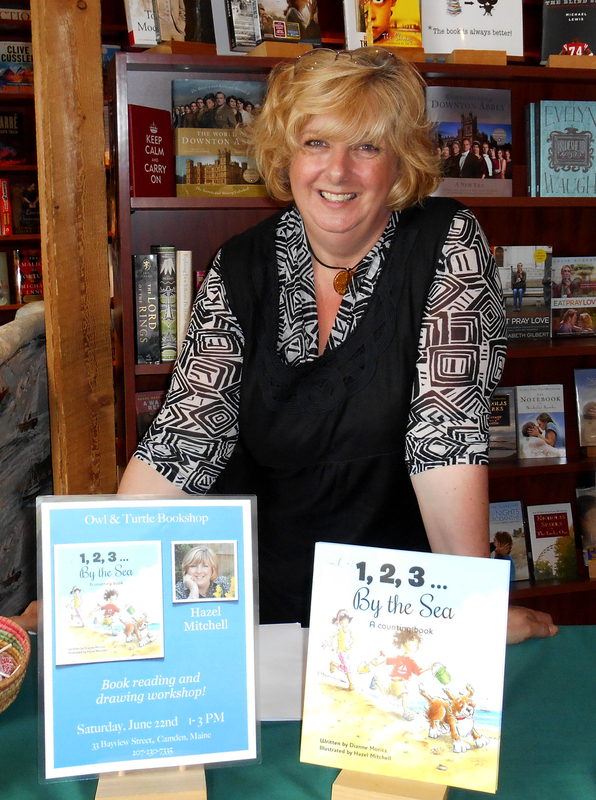 Meet Author/Illustrator Hazel Mitchell: A KidLit Pearl! ONE WORD PEARL (Mackinac Island/Charlesbridge Publishing Fall 2013, Written by Nicole Groeneweg). *Pearl loves words. All kinds of words. Words make up songs, stories, poems . . . and what does a lover of words do? She collects them, of course! But one day, most of Pearl’s words are blown away, leaving her only a few which she keeps safely in her treasure chest. After that day, she uses each word carefully—one at a time, until she has no words left. When her teacher asks her questions at school, she doesn’t answer. When her friend wants to know what she has for lunch, she can’t respond. What will Pearl do without her precious words? Will she ever find them? Click here to watch the darling trailer for ONE WORD PEARL. See below for details on winning your own copy! 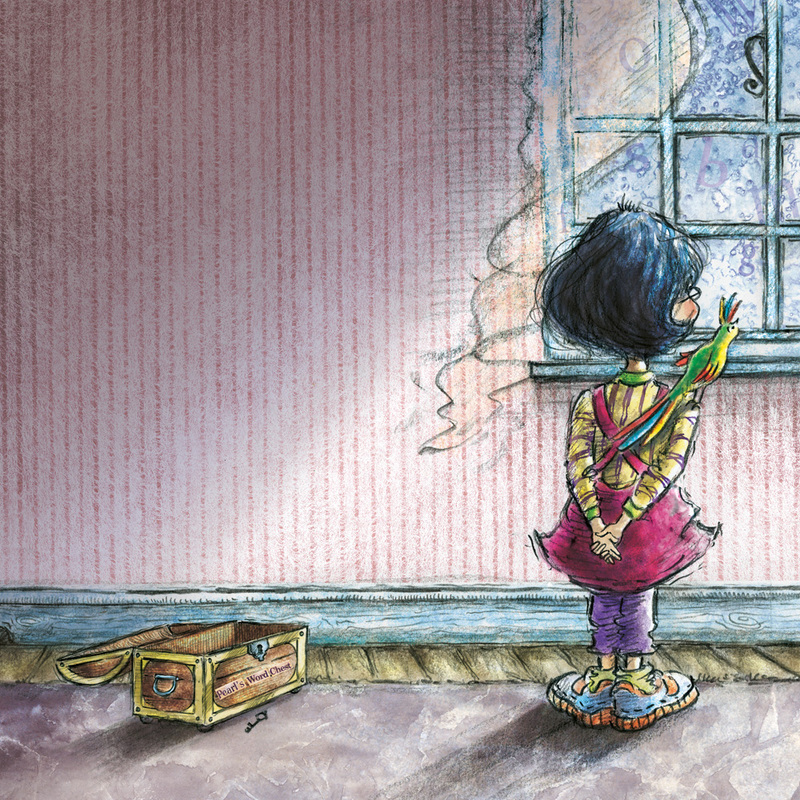 Nancy: A lot of people think that authors need to find their own illustrators in order to publish a picture book, which of course is not the case. However, I’m curious – have you ever known an author personally before you were asked to illustrate their work? Hazel: All the trade books I’ve published have been with authors I didn’t know. The editor/art director chose the illustrator. People entering, or beginning to write, don’t usually get this disconnect, but I think it’s how it should be. The illustrator is hired to do a job and bring their vision to a project. It’s hard if you get too much input from the author, or very specific directions, because your own ideas take a back seat. I can understand how hard it is for an author sometimes, they’ve lived with their characters for so long! I’ve done self publishing projects in the past where I’ve worked closely with an author on their vision. To me that’s a different kind of illustrating, more of an ‘artist for hire project’ in which you expect to follow tighter guidelines. But in general, working with an author on a project isn’t easy. That’s why we have art directors! Nancy: Your drawings of children are delightful. Do you have kids in your own life you model them after? Where is your favorite place for people watching? Hazel: Thank you! When I began my career in illustration I always thought I’d be illustrating animals, with minimal children. It’s been quite the reverse! I have learned to embrace drawing children, although it’s been a steep learning curve. The looser the drawing the better, is how it works for me. I do not have children, and my step children are grown. I usually do research on the specific type of child for a project. Youtube is a great source of reference for studying children! And if you pause them, it’s even easier!! Mostly I draw from imagination. My favorite place for people watching .. sitting in a Parisian Cafe with an excellent cup of coffee, a croissant and a sketch pad!! Nancy: You moved from the UK to Maine. Both are beautiful places, but do you ever long for hot, crispy summer days? Nancy: What kinds of things do you like to write? 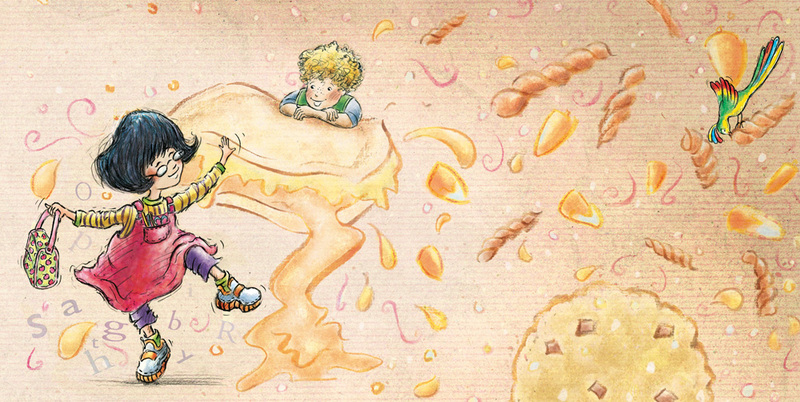 Are illustrations swirling in your head whenever you write? Hazel: Writing and visuals are mixed up together for me. 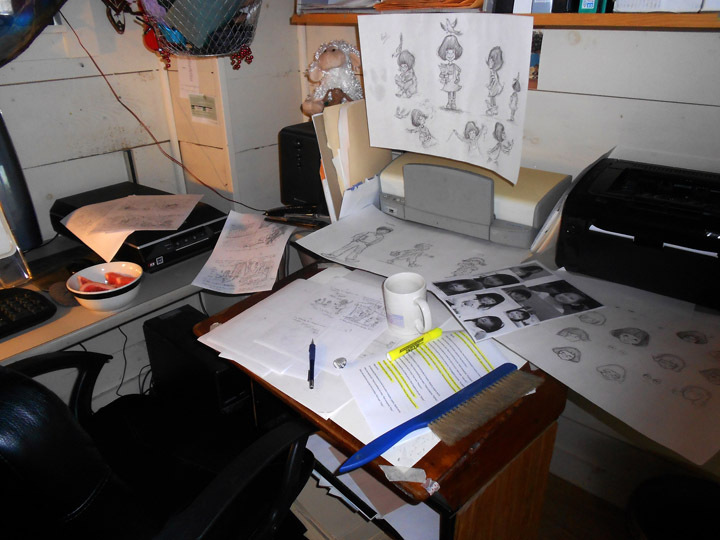 I have several projects on the go from picture books to a middle grade novel. I do find, that even when working on a picture book, the words are very important. I’ll write descriptions of what I see before I draw them, but at the same time the images are jumping in my head. If I’m writing straight prose, there’s a movie playing in my mind. Nancy: About how long is the creative process – from the time you take on a project (like ONE WORD PEARL) until you are holding the finished book in your hands? 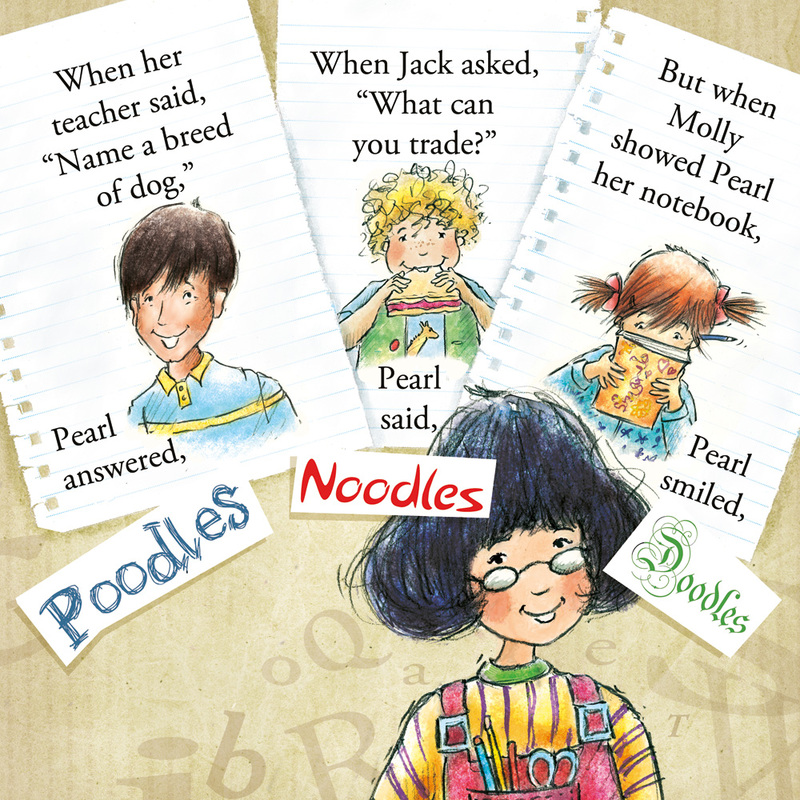 Hazel: One Word Pearl was a fast turnaround, about 3 months from receiving the manuscript. There isn’t much time for pondering. The book was in stores 7 months later. Of course it was in editing before I received it. I would love a nice, leisurely project!! 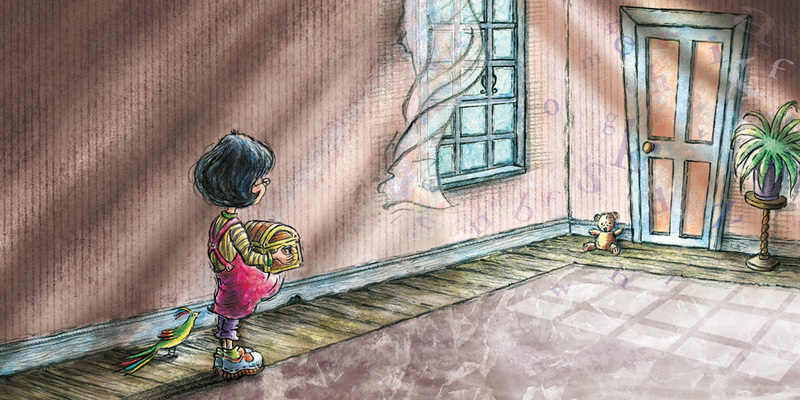 Nancy: If you could go back in time, is there any particular children’s book you would have loved to have illustrated? Hazel: That’s hard. When you think of the classics you love, they’re so set in stone, why would you change them? I think I am very attracted to chapter books, and I would have loved to illustrate something like Peter Pan. 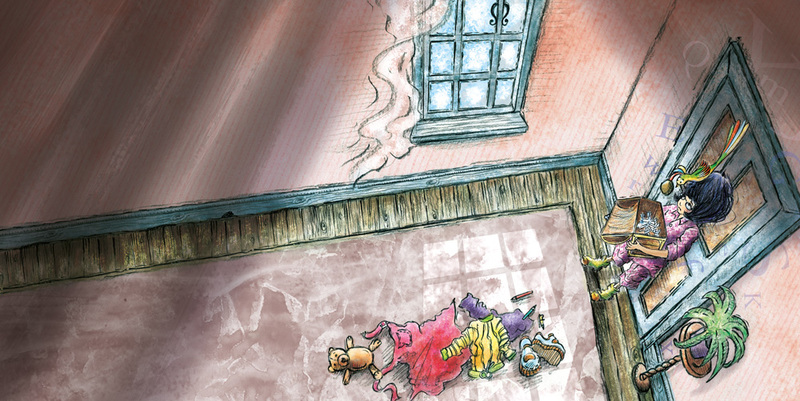 (Nancy’s note: I can see Peter Pan wanting to peek in the window in the above picture). Nancy: Here’s one that my writer friends and I wonder about: Which came first, the blog or the author page? Do you think it’s smart to get a blog rolling when you are pre-published, and then just link to an author page when there is something to promote? I’d love to know your thoughts since you have both (and both are so perfectly aligned visually!). Hazel: I started my blog first. I stayed off social networks for a while, but now I use everything in tandem. Which reminds me … I need to update my blog! BOOK GIVEAWAY! Hazel has generously offered a copy of ONE WORD PEARL to one lucky reader. Just enter your favorite word in the comments below, and I’ll put your name in the hat! If you’re not the gambling type, ONE WORD PEARL is available at your local indie bookstore. Just click here! 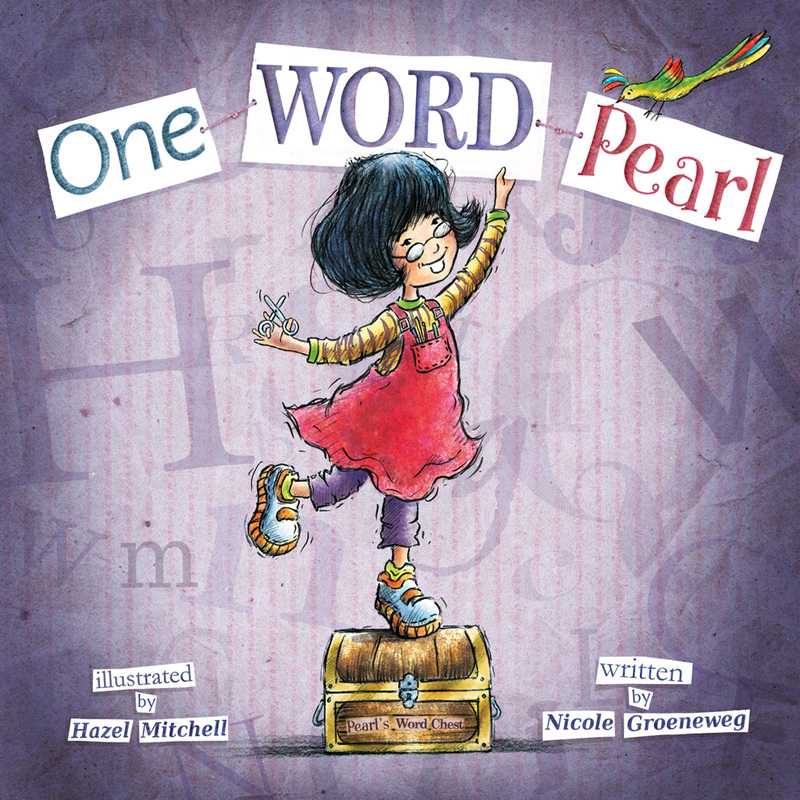 Update 9/30/13: Congratulations to the winner of a copy of ONE WORD PEARL, Michele Manning! Thanks for playing. By the way, my favorite word is fresh. I especially like it in the context of fresh sheets, fresh piece of paper, and my all time favorite, fresh pot of coffee. 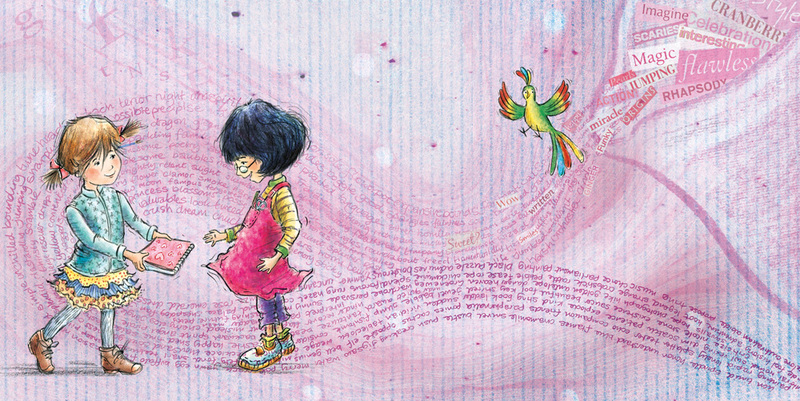 Nancy Tandon • This entry was posted in Art, Author Interview, Illustration, Picture Books, Reading, Writing and tagged Author/Illustrator, ONE WORD PEARL, Picture Books. Bookmark the permalink. Will definitely purchas this book — great story and fabulous illustrations Hazel. I love the video trailer. My favorite word – scrumptious! Apparently I am loving the word “wonderful” tonight!! Puzzle… Don’t actually like to do them but love how the words zings on the tongue. Great interview, can’t wait to read the book! Imagination; Great interview, I enjoyed learning more about the new book and Hazel Mitchell’s creative process. Thanks everyone for your kind words, so enjoyed visiting!